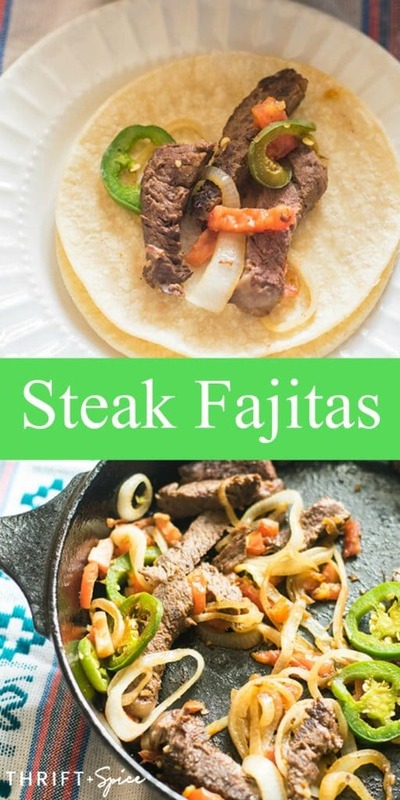 This is a delicious steak fajitas recipe that is perfect for busy weeknights. 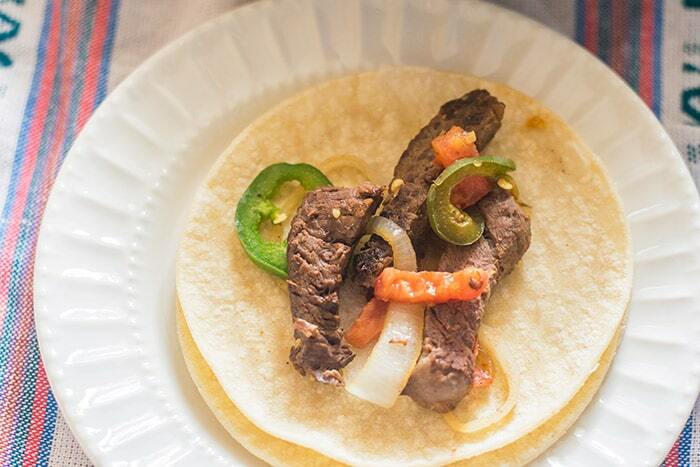 Steak fajitas are an easy meal that comes together in no time. Fajitas consist of strips of meat and sautéed veggies served on warm corn or flour tortillas. 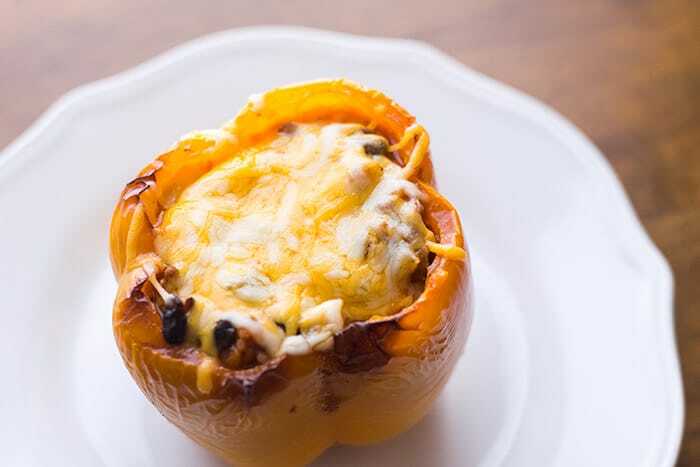 They are a Tex-Mex Favorite! I prefer steak but chicken fajitas are also very yummy! Skirt steak is traditionally used in fajitas but I’m using ribeye because that’s what I had in my freezer and it’s just as good if not better! Steak fajitas are one of my favorite recipes. My husband absolutely loves them and I love the fact that they can be on the table in less than 30 minutes. If you need a side dish my Mexican rice or Mexican pinto beans are a good choice. My recipe is pretty spicy but if you aren’t a fan of spicy food no problem you can totally alter the spice level of this recipe. Believe it or not I am actually trying to take it easy on spicy food these days which is pretty hard for me cause I LIVE for spicy food! 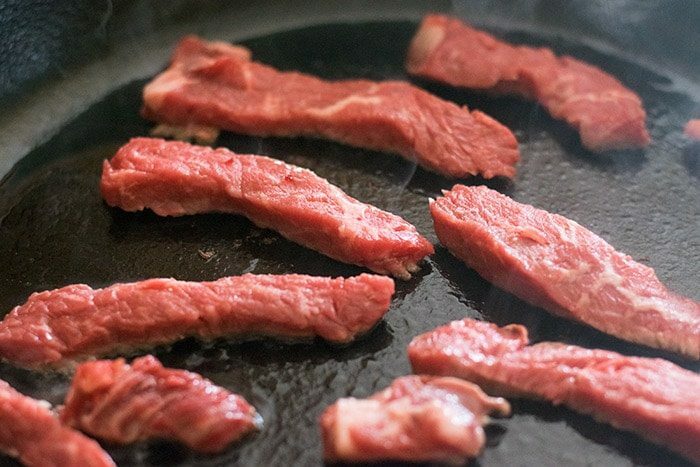 Take your ribeye steaks and cut them into strips and season with salt. Heat up 1 tablespoon of oil in a cast iron skillet over medium high heat. Once hot add some of the slices of steak to the skillet. Don’t add them all at once you don’t want to crowd the skillet or the meat will steam and we want it to brown. So you’ll have to do this in batches. Cook on each side for a few minutes or until nice and brown. I also like to take my kitchen tongs and use them to sear the sides of the slices. Now I am just gonna come out and say this even though you may think I’m weird but I do not like any pink in my steak. It really grosses me out. Whenever I order a steak I always get it well done and yes I like A1 sauce on it. I’m aware that most people prefer rare or medium rare but I just can’t do it. When making my fajitas I cook it long enough so that there is no pink inside. However, you are welcome to cook it to your own liking. After cooking I transfer the slices to a paper towel lined plate to let any grease drain. Add the chopped veggies to the skillet and saute for about 3 minutes or until they have softened a bit. Add the spices and salt to taste. Stir well to make sure the veggies are evenly coated with the spices. Now remove the skillet from the heat and add the meat back to the skillet and stir again. You can serve these fajitas over corn or flour tortillas. 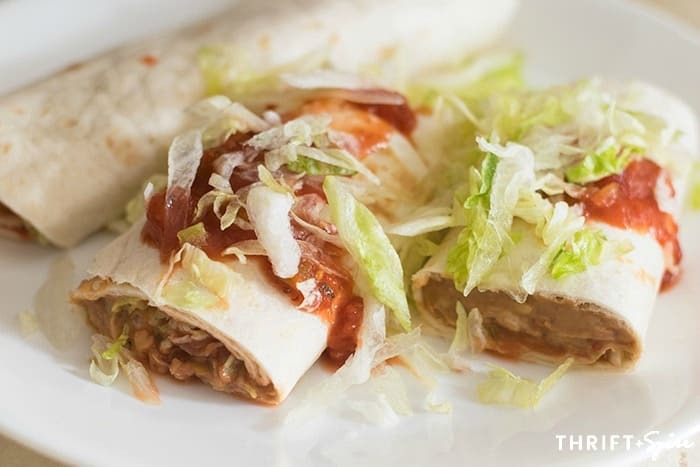 They would be especially delicious served with my homemade flour tortillas give them a try! If you cook a lot of Mexican food you most likely already have most of the ingredients on hand. If not you won’t have to pick up much this is a pretty simple recipe. If you are trying to avoid spicy food you can replace the jalapeno with a bell pepper. And you can add a little less chili powder if you want. You’ll also need salt but I assume most people already have that so I didn’t include it on the shopping list. 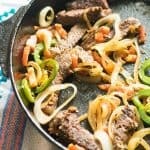 This easy and delicious steak fajitas recipe can be ready and on the table in less than 30 minutes! It’s a simple recipe that doesn’t include any unnecessary seasoning mixes. 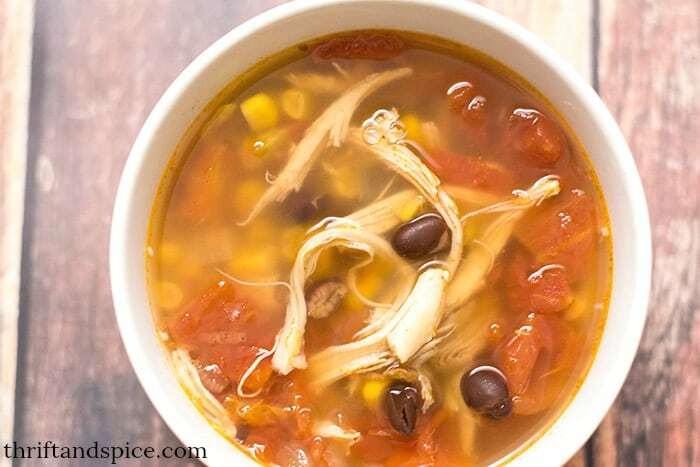 It also makes for a great Cinco de Mayo recipe. 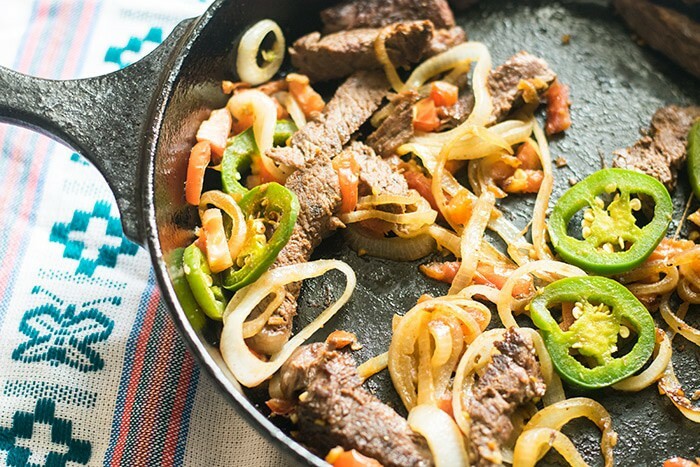 This Steak Fajitas Recipe is the perfect weeknight Tex-Mex meal with minimal ingredients needed. Slice the steaks into thin slices. Season with salt. Heat up the oil in a large skillet over medium high heat. Once oil is hot add some of the meat and cook for a few min on each side or until nicely browned. Make sure to brown the sides as well. Cook the meat in batches so you don’t crowd the skillet. Transfer cooked meat to a paper towel lined plate to drain. Add the chopped veggies to the skillet and saute for a few minutes. Add the spices and salt to taste. Stir well to make sure the veggies are coated. Remove skillet from heat. Return the meat to the skillet and stir again. 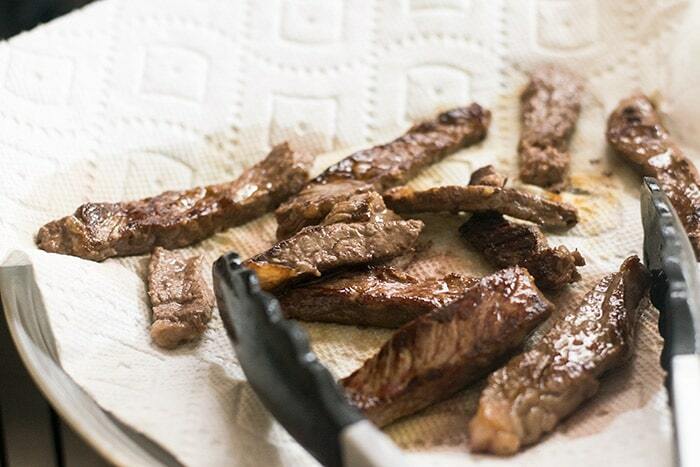 If you liked this Steak Fajitas recipe you might also like….